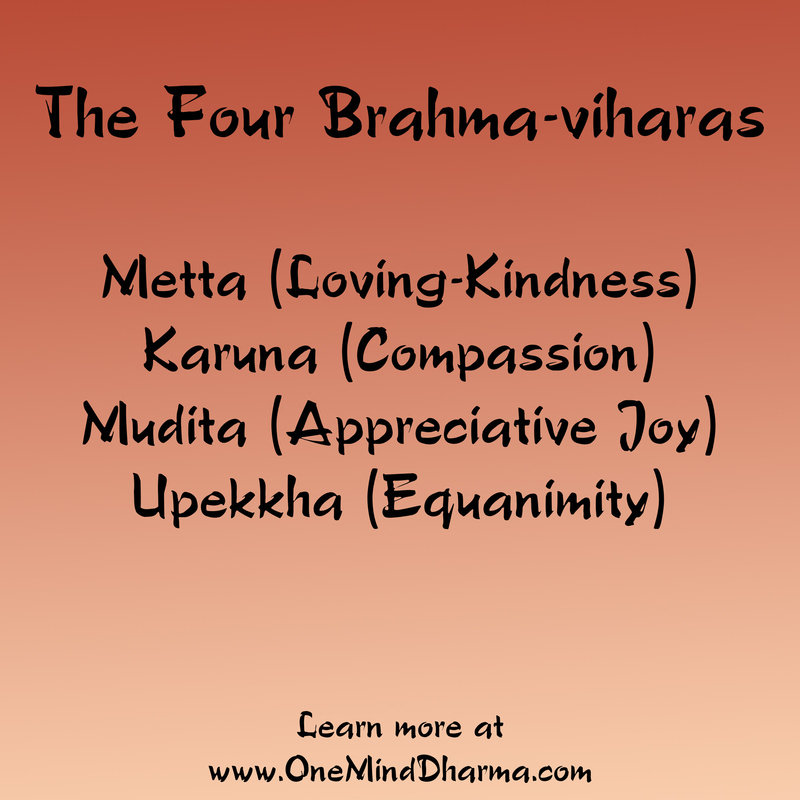 The four Brahma-viharas are four qualities that we cultivate in and out of meditation practice. They are qualities of the heart, offering a counterpart to the Buddhist insight practices. It’s often said that the mindfulness/insight practices are like one wing of a bird and the brahma viharas are like the other wing; a bird requires both wings to fly correctly. 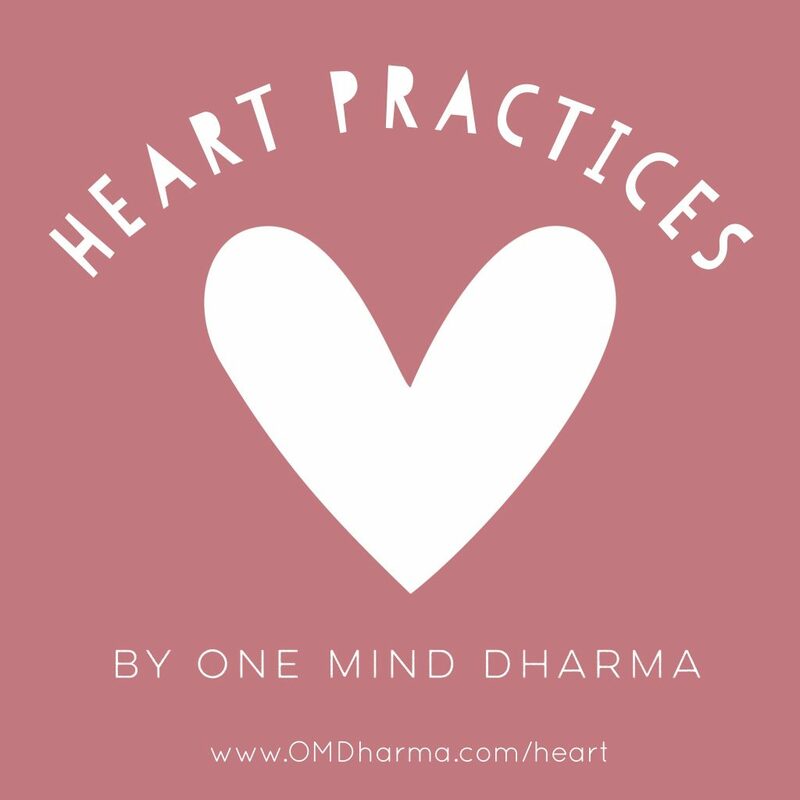 The brahma viharas, often referred to as the “heart practices,” are cultivated via specific meditation practices, but they also permeate our mindfulness and concentration practices. The term Brahma-vihara is Pali, and comes from two words. First, there is the word brahma. In the Buddha’s time, a brahma was a deity who lived in a heavenly realm. The word vihara means abode or dwelling. As such, brahma vihara can be directly translates as “abode of the divine” or more commonly, “heavenly abodes.” This is pointing toward the mind of one who has fully cultivated these qualities. Cultivating the heart qualities leads to a calm, joyous mind. Although these practices are often slighted, the Buddha suggested on many occasions that developing the Brahma-viharas fully leads to awakening. Metta is the first of the four heart practices and can be seen as the foundation of the Brahma-viharas. Metta is a Pali word that is most commonly translated as loving-kindness. Sharon Salzberg points out in her book Lovingkindness that the word metta shares a root with the Pali words for both friendship and gentleness. Although loving-kindness is the most popular translation, we think that “gentle friendliness” is more accurate. Regardless of the English word you use, metta is metta. Rather than seeking to define it perfectly, we should seek to know and understand it experientially. Metta is a quality of the heart that we cultivate toward all sentient beings (including ourselves). It is the opening of the heart to the experience of others. We cultivate metta through loving kindness meditation. Put most simply, metta is wishing well for others. It is a friendliness, or a gentleness that we offer. In metta meditation, we practice setting this intention to care for others. We may reflect on our own deepest desire to be happy and at ease, remembering that all other beings share this same desire. Knowing that other beings just want to be happy, we can cultivate a heart that cares for the wellbeing of others. Metta doesn’t mean we walk around feeling joyous all the time; it is simply a quality of caring about beings and their wellness, and it is a unifying quality. Metta (and equanimity) can also be found on the list of perfections. Learn more in our post about the paramis and paramitas at https://oneminddharma.com/the-6-paramitas/. Check out our page on Loving Kindness Quotes. The second Brahma-vihara is karuna, or compassion. Compassion can be understood as what happens when metta meets suffering. Whether it is suffering we experience, or the suffering of another, compassion is caring about and being present for the pain we all experience. Compassion is a quivering of the heart in response to suffering in the world. When we come into contact with pain or suffering, the reaction is often to avert. Compassion is an antidote to aversion, which is one of the Three Poisons, or causes of suffering. Compassion means we “suffer with.” It doesn’t mean we become codependent or rest our happiness on the happiness of another, but we do allow our hearts to open to any suffering with which we come into contact. In compassion meditation, we practice cultivating the compassionate heart. This means we set the intention to care for the suffering of ourselves and others, rather than pushing it away. Cultivating compassion doesn’t mean we invite suffering in, but we do welcome it when it comes. Setting the intention to care and be present for suffering, we are able to better offer love and support to anybody suffering. Furthermore, compassion helps us not react so strongly with aversion to our own suffering. The third of the Buddhist heart practices is mudita, or appreciative joy. The Pali word mudita is sometimes translated as sympathetic joy or empathetic joy, but these terms make it hard to relate mudita to our own happiness. We find “appreciative joy” to most accurately represent what mudita is. It is simply the practice of appreciating joy and happiness. Metta becomes compassion when it meets suffering, and it becomes mudita when it meets joy. The quality of mudita is a quality of sharing in joy. When we experience joy ourselves, we often end up not truly appreciating it. We give a reason why we don’t deserve it, know that it won’t last, or simply don’t really notice the joy we are experiencing. With mudita, we recognize the impermanence of joy, and really rejoice in the experience while it is present. When others experience joy, jealousy or judgement may arise. Mudita is an antidote to jealousy and envy, allowing us to simply rejoice that this other person is experiencing happiness. Mudita practice helps us cultivate this quality by continually setting the intention to be present for joy. Mudita meditation, when practiced over time, opens the heart to the joy in and around us. We begin to see more joy, and really find ourselves stopping to enjoy it. Mudita practice is a gradual process of opening the heart to joy. It may seem like this would be a relatively easy Brahma-vihara to work with, but we often see that we resist actually experiencing joy quite a bit. 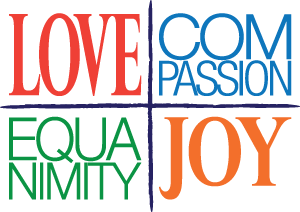 Read some thoughts about joy from leaders and teachers on our Joy Quotes page. The final of the four Brahma-viharas is upekkha, or equanimity. Equanimity may be seen as the balancing factor that keeps us stable in the opening of the heart. Upekkha is the quality of remaining stable in the midst of everything. As a quality of heart, equanimity helps us not completely base our happiness on the actions and feelings of others. Equanimity is a container of balance that helps hold all of the other Brahma-viharas. Words often used in association with equanimity include acceptance, patience, and stability. This quality of heart, when developed, leads to these three qualities. We are able to separate our wishes for someone from reality, and not cling to how somebody else should act. Check out our page of equanimity quotes for some wonderful thoughts on equanimity. With equanimity practice, we recognize that the happiness and suffering of another person is dependent upon the person’s actions. One of the common phrases used in equanimity meditation is, “All beings are in charge of their own karma.” Upekkha practice brings us acceptance and patience with others. Although we may have compassion or wish well for somebody else, this doesn’t mean it will “cure” them or take away all of their suffering. Rather, the heart practices are about opening our own hearts. 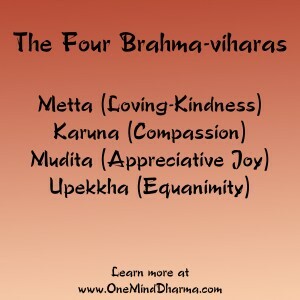 Enter your email address and we will send you four free guided meditations investigating these four brahma-viharas!